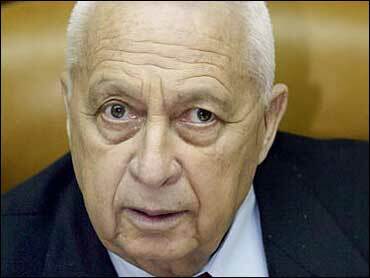 Israeli Prime Minister Ariel Sharon ordered the dismissal of two hardline ministers Friday, paving the way for his Gaza pullout plan, but also triggering a possible political crisis. The Cabinet will vote on Sunday on dismantling 21 Jewish settlements in Gaza — a plan backed by the United States, reports CBS News Correspondent Robert Berger. The hawkish Cabinet remains deeply divided over the plan; if and when it's implemented, Sharon's government will probably collapse. Sharon sent the dismissal notices by special messenger to the two ministers of the hardline National Union Party, Avigdor Lieberman and Benny Elon, after they failed to answer a summons to his office. They would take effect in 48 hours, before the crucial Cabinet session Sunday. "According to the protocols of the law I have decided to relieve you of your post, as is my right as prime minister," government officials quoted the terse letters as saying. Cabinet Secretary Yisrael Maimon informed other Cabinet ministers that the two had been fired, a senior official said, speaking on condition of anonymity. A government messenger delivered Lieberman his dismissal notice as he worked out in a gym, officials said. "I am proud to be fired by the Prime Minister who is taking this unprecedented step of firing a minister because...he does not agree with him," Lieberman told Israel Radio. "I joined this coalition on the basis of agreed principles, there is no connection between these principles and the disengagement plan," he said. Elon, speaking to Army Radio from an undisclosed location said he was doing his best to dodge the prime ministerial courier. "I will make every effort to make it difficult for the prime minister, that is, he has not yet given me the letter and my firing has not yet taken effect," he said. According to Haaretz newspaper, Elon said he could not even be sure the message actually had come from Sharon. For Sharon the decision to fire the ministers represents the next stage of his decision to break from the far right and from his legacy. The last year has seen Sharon transformed from a driving force behind the settlement movement to staking his credibility on his ability to remove all the settlements from the Gaza Strip. Sharon has publicly pledged to bring his pullout plan to a Cabinet vote on Sunday, even though he has no guarantee it will pass. Even a victory could lead to the dissolution of his coalition government. Firing Lieberman and Elon should give Sharon a 11-10 majority for his plan in the Cabinet, but another pro-settler faction, the National Religious Party (NRP), has threatened to quit if Sharon dismissed the National Union. NRP leader Effie Eitam described Sharon's concept of removing settlements as "a terrible, immoral, bitter thing." Hawkish members of Sharon's Likud Party are also close to the point of rebellion, raising the prospect of a snap election within months. Throughout Thursday, Cabinet ministers tried to work out a compromise to prevent a coalition crisis, but Sharon was adamant. "I intend to honor my commitment to bring the decision to the Cabinet this Sunday," he said. Lawmaker Yossi Sarid of the dovish opposition Yahad Party ridiculed the suggested compromise, which would postpone voting on settlement evacuations for many more months. "It's a plan without a plan, disengagement without disengagement … a meatball with no meat, chicken soup without chicken, a concert without music," Sarid scoffed. Sharon's proposal is a pullout from all of Gaza and four small settlements in the West Bank over four stages by the end of next year. Sharon, up to now the main mover behind settlement construction, has said there is no future for 7,500 Jewish settlers among 1.3 million Palestinians in Gaza. Settlers in Gaza control around 15 percent of the land. Sharon does not hide his underlying goal — to trade the 21 small Gaza settlements for control of the main settlement blocs in the West Bank, where most of the 230,000 Jewish settlers live. That would be contrary to Palestinian demands and United Nations resolutions. Settlements on occupied land may be considered violations of international law. Article 49 of the Geneva Convention relative to the Protection of Civilian Persons in Time of War reads, "The Occupying Power shall not deport or transfer parts of its own civilian population into the territory it occupies." But President Bush endorsed the pullout plan at a meeting with Sharon in April, adding support for Israel in key elements of the dispute with the Palestinians, including backing for Israel's holding on to some settlement blocs in the West Bank. That infuriated Palestinians. While Palestinians welcome Israel's proposed exit from Gaza, they insist it must be the start of a similar evacuation of the West Bank. Palestinians claim all of the West Bank and Gaza for a state. Mr. Bush later said that his support for Sharon's plan did not prejudge a negotiated settlement involving the Palestinians. The president has met several times with Sharon, but never with Palestinian President Yasser Arafat, whom the U.S. accuses of ties to terrorism. In an interview on a French radio station Thursday, Secretary of State Colin Powell called the plan "a good start" and appealed to the Palestinians to prepare for a pullout.